Aghvan Hovsepyan was born on January 7, 1953 in Yerevan. In 1974 after graduating from the faculty of Law of Yerevan State University he began his working activity in the Prosecutor’s Office of Segezha region of Karelian ASSR as an investigator. In 1978-1986 he worked in NKAR Prosecutor’s office, as senior investigator, prosecutor’s assistant, then – head of investigator’s division. In 1986 he moved to Armenia and worked as an investigator of Artik region Prosecutor’s office till 1989. In 1989 Aghvan Hovsepyan was appointed as an investigator of especially important issues adjunct to the Prosecutor General of the Republic of Armenia, and in April 1998 – head of investigator’s part of RA Prosecutor’s Office. In 1998-1999 Aghvan Hovsepyan held the post of the Prosecutor General of the Republic of Armenia. From November 1999 he was the Deputy RA Prosecutor General, member of RA Justice Council. By the decree of March 17, 2004 of RA President, Aghvan Hovsepyan was again appointed Prosecutor General of the Republic of Armenia. By the presentation of RA President on September 13, 2007 he was elected Prosecutor General of the Republic of Armenia by the National Assembly. In 1991- 1995 Aghvan Hovsepyan was elected as a deputy of the Supreme Council of the Republic of Armenia. In 1999 Aghvan Hovsepyan defended a thesis on Prosecutor’s Supervision, receiving scientific degree of the candidate of legal sciences. In 2005 he was conferred a title of doctor of legal sciences for defending a thesis on the theme “Prosecutor’s Activity and the Issues of Combating Against Hooliganism.” Numerous monographs, scientific works and articles were published by the authorship of Aghvan Hovsepyan. By the decree of the President of the Republic of Armenia in 1999 Aghvan Hovsepyan was conferred a class degree of the state adviser of the Justice. 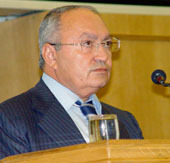 In 2003 he was conferred a title of honoured jurist of the Republic of Armenia. By the decree of December 29, 2006 of RA President, Aghvan Hovsepyan was awarded a medal of 1st degree for the services rendered to the Motherland for significant contribution in protection of legality and legal system. He was given also state, governmental, international and departmental awards for working activity. Aghvan Hovsepyan is a member of a number of international scientific institutions and academies.